Kitano Tenmangu Shrine in Kyoto is famous as a place to view the plum blossoms, and also for enshrining the god of learning, Sugawara no Michizane, and for this reason, the shrine is also popular among students. On the 25th of every month, there is a very popular flea market held at the shrine called Tenjin-san, but the busiest months for this flea market are the last one of the year in December and the first one in January when the whole shrine area is crowded with both people and stalls. Close to the shrine you can buy two specialties of it, Awamochi and Chogoromochi, which are both now famous all around Japan. So let’s look at how Kitano Tenmangu Shrine became associated with these sweets! 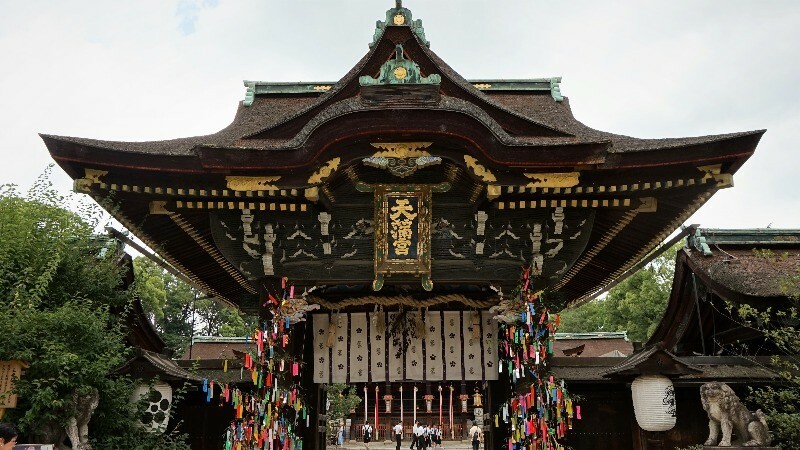 Kitano Tenmangu enshrines the god of learning, Sugawara no Michizane, so it’s natural that the shrine is popular among students facing exams. It is said that if you pet the cow statues of the shrine you will get wiser, so you can see many people petting the cows. When it gets to February and March, the plum trees blossom, and the biggest event of the year takes place at Kitano Tenmangu Shrine. 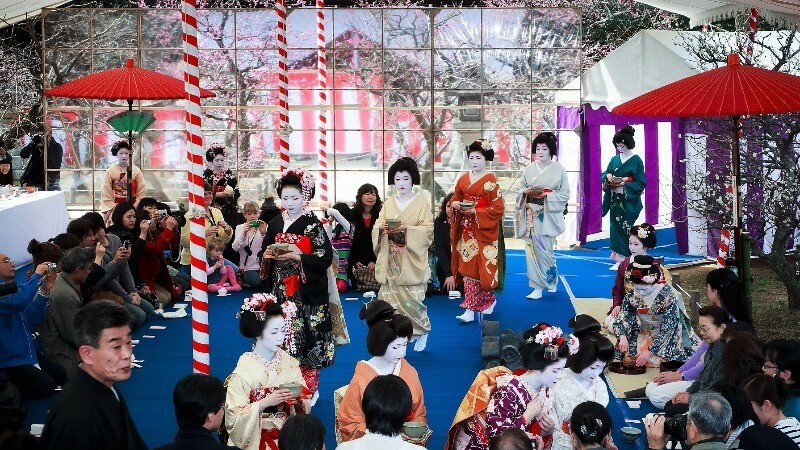 At this event, you get to see maiko in their beautiful kimonos, and they will even pour tea for you. This event is something you just have to see and experience for yourself. The history of Awamochi dates back to the Muromachi period, around 500 years ago. During this period the people living around Kitano Tenmangu were not very healthy, so these “rice cakes” are made from foxtail millet which was cheaper than rice at the time. Compared to rice cakes these foxtail millet cakes are more yellow and have a grain-like taste to them. 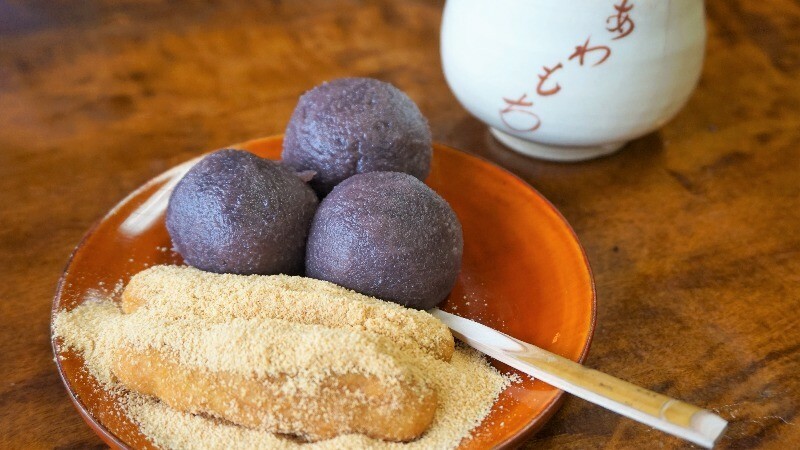 They are coated with either red bean paste or roasted soybean flour. This Japanese sweet was first made by a man called Kawachiya Chogoro, and this sweet was named Chogoro by no other than the eminent daimyo Toyotomi Hideyoshi, who liked the rice cakes made by Kawachiya Chogoro so much that he thought they should be called Chogoromochi. 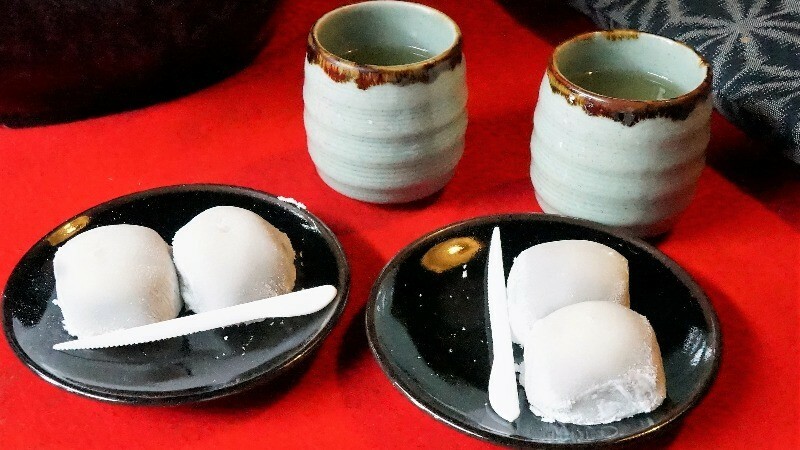 The rice cakes called Chogoromochi contain red bean paste that is very light, and not too sweet, and the cakes just melt in your mouth into sugary goodness. Kitano Tenmangu Shrine is beautiful every season of the year, and there is a big flea market held at the shrine every month, but you shouldn’t forget to also try the sweets it’s so famous of. Unlike some other Japanese sweets made of red beans, the sweets here are not too sweet, and Awamochi and Chogoromochi are both great for a Japanese afternoon tea moment with sencha or gyokuro tea. The best before date on these sweets is very short so I recommend eating them on the spot!